Vitamin C (as ascorbic acid), bulking agent: natural Lithothamnion calcarea; rosehips powder, anti-caking agent: stearic acid*; flow agent: magnesium stearate*; anti-caking agent: silicon dioxide; hypromellose coating. *(Vegetarian source). Take 1 - 3 tablets a day, with meals, or as your health professional advises. More than 1000mg of Vitamin C may cause mild stomach upset in sensitive individuals. 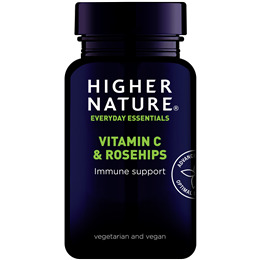 Glucose is used in the manufacture of the vitamin C.
Below are reviews of Rosehips C 1000 - Vitamin C - 90 x 1000mg Tablets by bodykind customers. If you have tried this product we'd love to hear what you think so please leave a review.